With Piglet’s christening in a little over a month, I have started to think about what I’m going to wear. My wardrobe consists of jeans, treggings and a selection of stripy tops. Not exactly ideal for wearing to an occasion like a christening (especially when I need to be in the photos). I’ve been looking for a new top to pair with a nice pair of trousers I couldn’t see anything that caught my eye. Whilst looking I drifted over to the dress section and pondered ‘can I pull off a dress?‘. It has been so long since I last wore a dress that I’m worried that I’ll just look ridiculous. I don’t want to look back at the photos and think ‘what was I wearing?‘. Each of the four dresses has elements that I like but just not sure which one is me. The first dress offers the navy blue flowers which would tie-in with Mr. Boo and Tigger’s navy shirts. Although I’m sure how practical white would be when carrying a one-year-old around for most of the day. The second dress is fun and colourful, however, the mesh top makes me think that it looks more like a going out dress rather than a formal occasion. 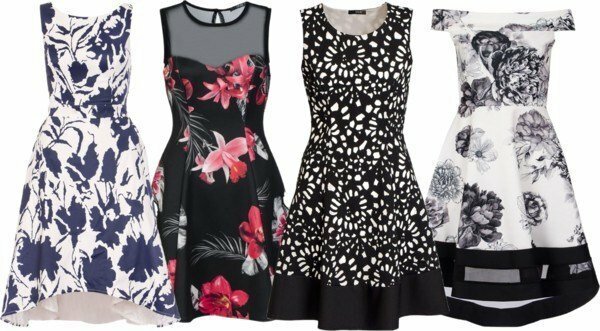 Whilst dress three is what I would class as a typical me choice, it is mainly black with a scattering of white behind the floral design. I just worry that it is a little boring, reserved and will make me look and feel a little frumpy. The final dress is cute, and it was the hem that caught my eye as I was looking, I like the dipped hem finished with the mesh to add a little contrast. However, I’m not keen on the dropped shoulder straps even though it would be hidden behind a jacket. Disclosure: This is a collaborative post, however, I really value your opinion on which dress you think would suit me for Piglet’s christening. I haven’t worn a dress for eons but am thinking that now I’ve lost so much weight and my wardrobe needs overhauling completely, I could do with a number or two for the odd night out. My preferences are numbers one and three. Have you decided which to go for? I can’t decide between one and three. Maybe I should treat myself to both! Definitely. That’s the best idea. Just to be safe and all that… Hope the christening goes well! I love dress number three. Firstly, yes of course you can pull off a dress. I really like the first one and could see you wearing it. It’s a flattering style and I love the way the hen lifts a little at the front to show a hint of leg. Oh I love all of those dresses they are fab, you would rock any of them I’m sure!